The impression that made surfers who visit your website is crucial. With CDN (Content Delivery Network), a network of servers distributed around the world, you can improve the speed and security of your website and enhance your online presence. 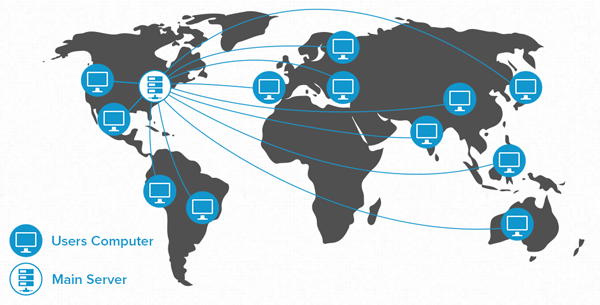 CDN stores all the data of your website in different servers around the world. The visitors of your site get data from the server closest to them, and your site will load much faster, everywhere. Without CDN all your website files are stored in a single server, which means that the most geographically distant server users are faced with a slow loading site. 1 & 1 CDN powered by CloudFlare caches static content of your website and is distributed to a network of 23 data centers worldwide. Its functionality increases the connection speed between 1 & 1 server and CDN server, allowing dynamic content to load faster. The loading time of content can be up to 700% faster. The Mirage will speed up the loading of your pages on various mobile devices. The CDN also protects your website by analyzing your traffic by automatically detecting rogue access (spammers, SQL attacks, DDoS attacks, injection,..). Protecting your website increased automatically.